People love new babies. Almost as much, people love pregnant women because pregnant women are cute. Non-pregnant women especially love pregnant women because they can fetch them sparkling water and cake while they sip their own wine and thank the heavens above that they are no longer pregnant themselves. Actually, that could just be me. Anyway, because of this phenomenon, you will likely get lots of support from friends and family of this pregnant woman if you decide to throw her a baby shower. In turn, you should be able to throw her a very elegant baby shower without blowing your entire bank account by getting a little help from her (and your) friends. 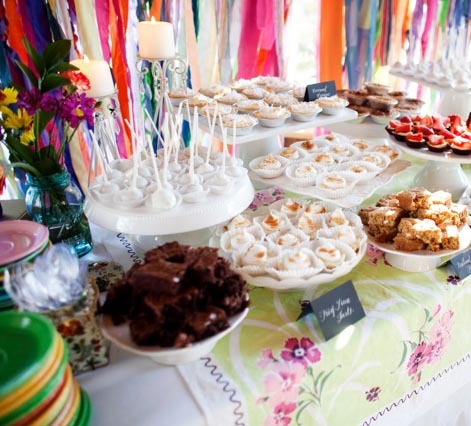 Here’s one idea for how to do just that: throw a potluck brunch baby shower. This accomplishes two things that can help to dramatically reduce the cost of a baby shower. First, it reduces the expectation of the size and extravagance of the meal. If you were to throw a full lunch or dinner, the expectation would be for a full buffet or even a sit-down meal, complete with a wait staff. Ex-pen-sive! When you throw a baby shower during brunch hours and advertise the event as such, the menu and service expectations become much more relaxed and, as a result, often the stage can be set for a lot more fun. No one needs to know that the idea is to save money with the potluck brunch baby shower. Our friends threw us a brunch baby shower, complete with beers, mixed drinks, a cranking iPod, a festival of babies and toddlers milling about, and a betting pool on when my baby would arrive. We had a blast! Second, the potluck feature distributes the food and drink expense across several participating co-hosts, most of whom will probably be very enthusiastic about contributing to the shower in some way, I assure you. And if you have ever hosted any kind of party, you know that food and drinks are often where the lion’s share of your expenses come in. And when the compliments start rolling in for what a wonderful success your elegant potluck brunch baby shower was, be sure to share them with your co-hosts. And maybe post a comment here on FinancialRx.com! Baby Shower Idea: Back to Campus! You’re dreaming of a dreamy baby shower for your fabulous friend, but you don’t want to break the bank. Here’s a unique idea that just might stirr up fond memories for her without costing a fortune.